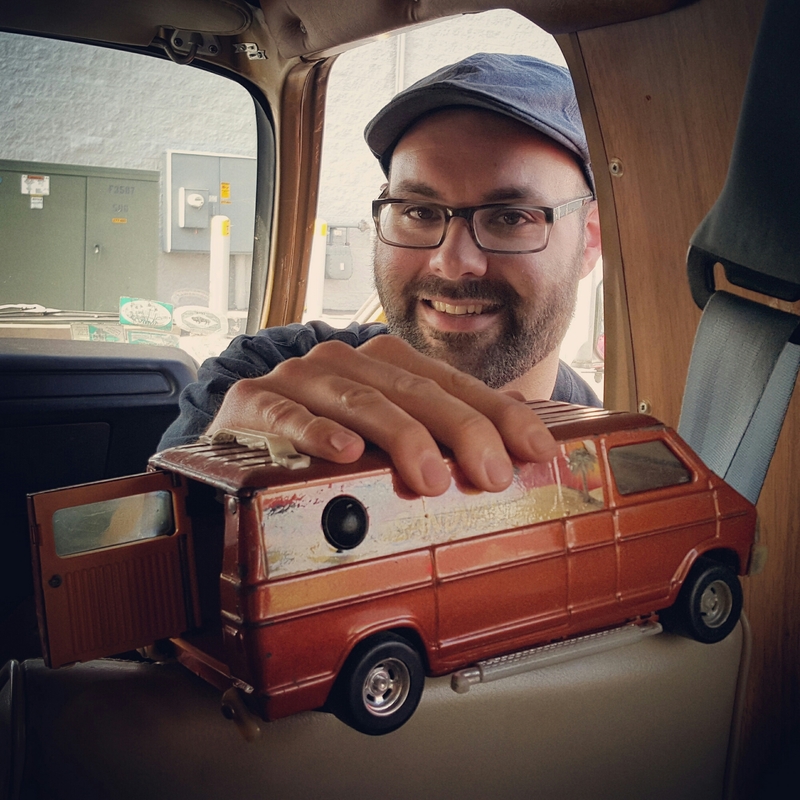 Adam and I bought a retro, 1975 Dodge B300 Camper Van in early July. It felt a little crazy, but it felt good. It was fun. 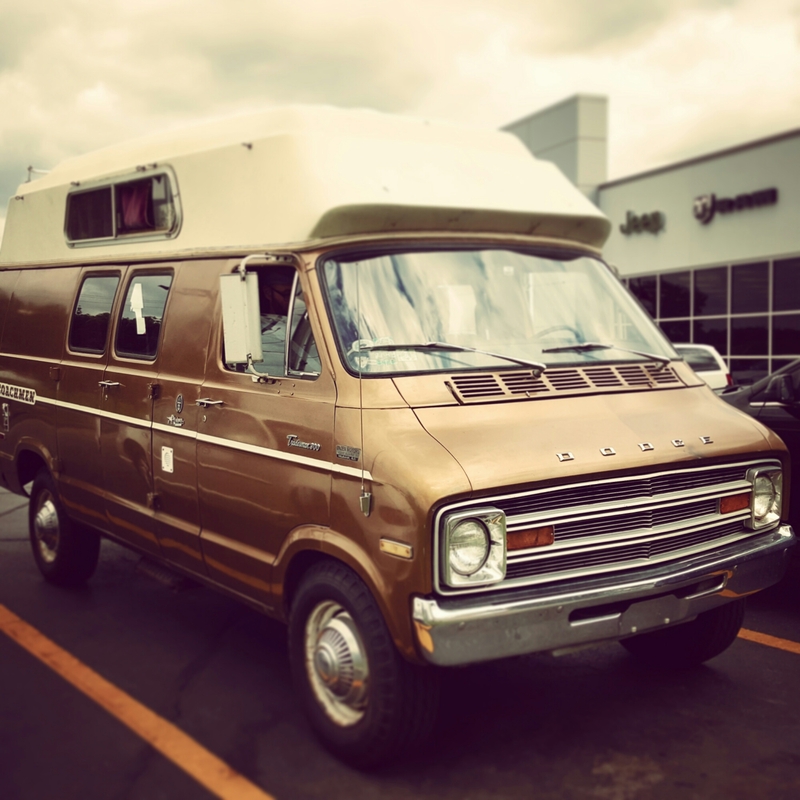 We loved that van when we first saw it on Craigslist and couldn’t stop daydreaming about it until we made an appointment to see it. How could you NOT love this thing!? We did everything we thought of to be smart about the purchase. Neither of us had ever bought anything on Craigslist, so we weren’t really sure how it would go. But we test drove it, inspected it, asked a million questions, and even paid $90 to have a local shop look it over and give us an idea of how much we’d have to put into it to get it up to par. 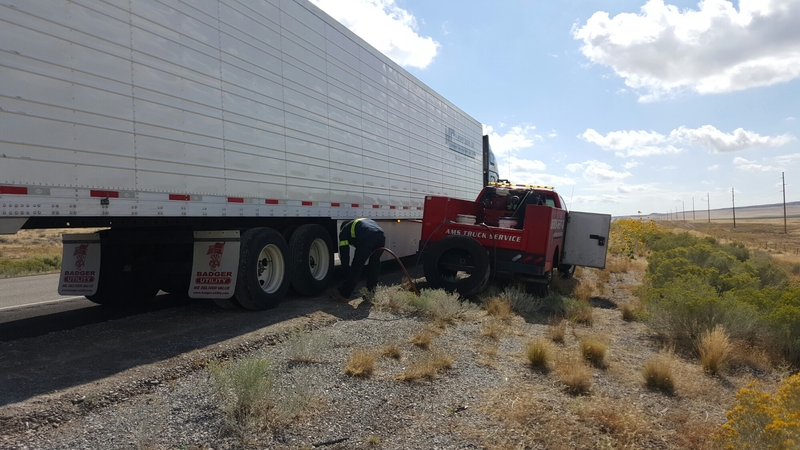 The initial inspection by us showed we would need to fix a seatbelt and get a turn signal working. These were things we knew were necessary to get fixed so it would be legal and safe to drive. The shop also told us while the tires were practically unused, they were so old they were cracking and needed to be replaced. 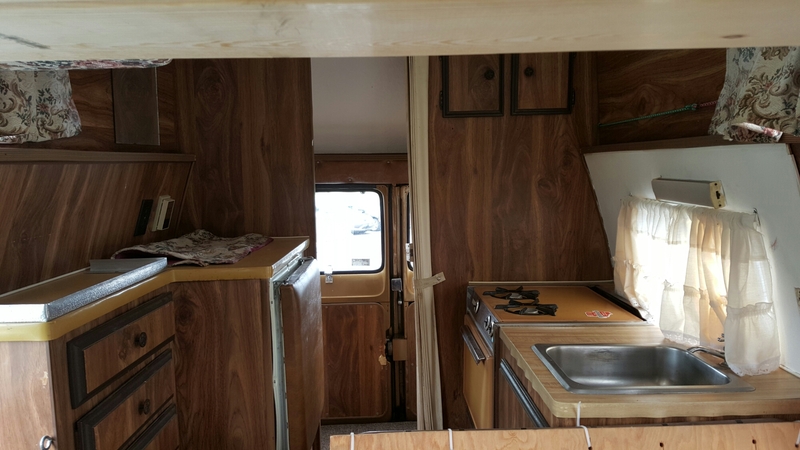 There were a couple of small leaks we didn’t have to worry about, and in general, the van was in great condition considering its 40-year old age. We decided to go for it. The price seemed right even though we knew we’d have to put some more money into it. We paid cash and drove it to the DMV to switch the title over and get our new RV plates right away. We were excited and didn’t want to waste any time. 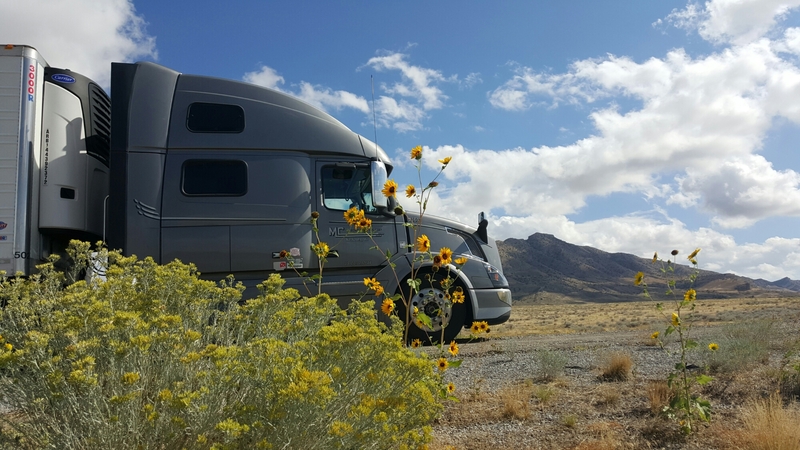 We had to head out on another trucking run to California that same night, so we dropped it off at our local dealer to get the ball rolling on getting a small list of things looked at, parts ordered, and fixed up. This little version came with it. Hah! And then it sat. For almost 2-1/2 months. Who knew getting parts for a 40-year old vehicle would be so difficult? Who knew our precious new old van needed waaaay more work than we thought? Who knew it would nearly die on us during the drive from Fond du Lac to Kaukauna? Oy. Well, we knew it was going to be a project, and it was. It is. But we didn’t know it would be a test of our patience, too. We just wanted to take it out for a spin. We wanted to spruce it up, decorate it, camp in it and show it to our friends. But we had to wait. A lot. 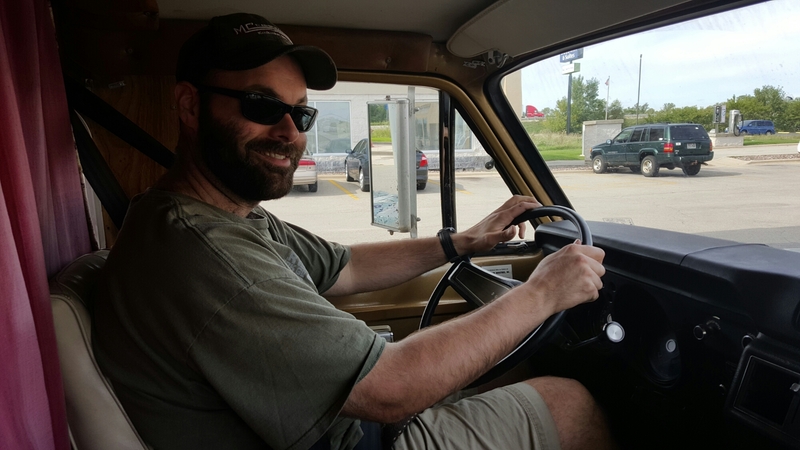 The good news to this story is that I can say that – finally – we were able to take Ol’ Burt (name is not yet official) for a joy ride! FINALLY! We’re so excited! Please keep your fingers crossed for us that he keeps running good and doesn’t need anymore major repairs! We just wanna’ play! Oh, and I’ll add a few more photos once we start moving in. I have some redecorating to do, also. 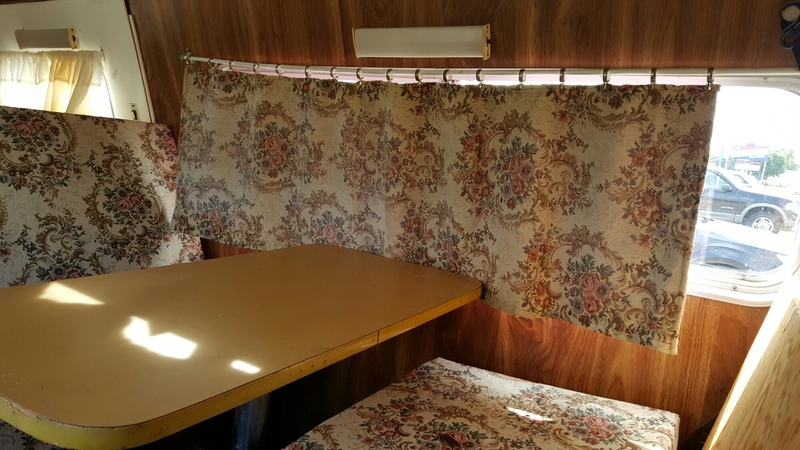 These curtains… Ugh. 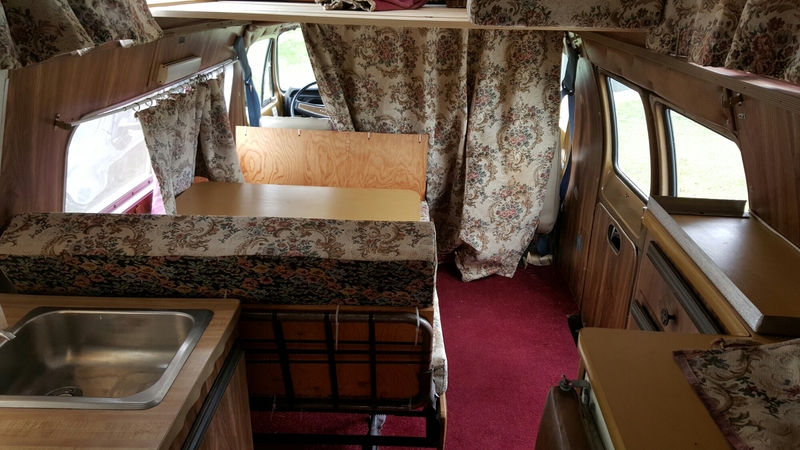 Tonight I love our new old camper van! 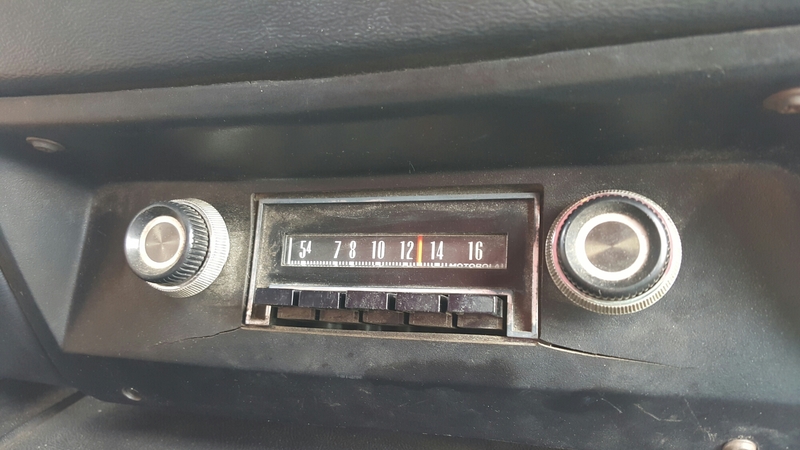 Original AM radio. We're totally gonna' jam out on this baby! Interior looking towards the front from the back. Interior looking back from the front. We can cook things! Adam driving. This is today! Whoop! 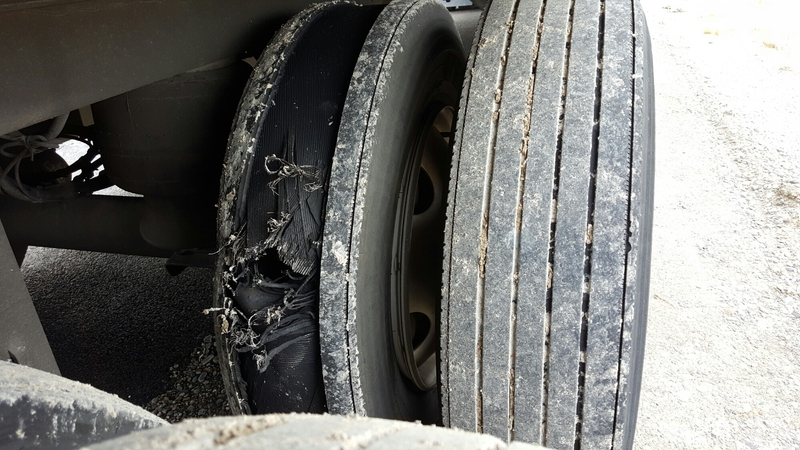 My first big rig tire blowout! Well, I blew my first big rig tire yesterday. This was no flat tire that goes, “thump-thump-thump” like when you get a flat on a car. This sucker went “boom” and included flying rubber shrapnel. But it also wasn’t nearly as dramatic as it could’ve been. In fact, considering it actually “blew,” it was pretty mild. And know what? That’s totally okay with me! 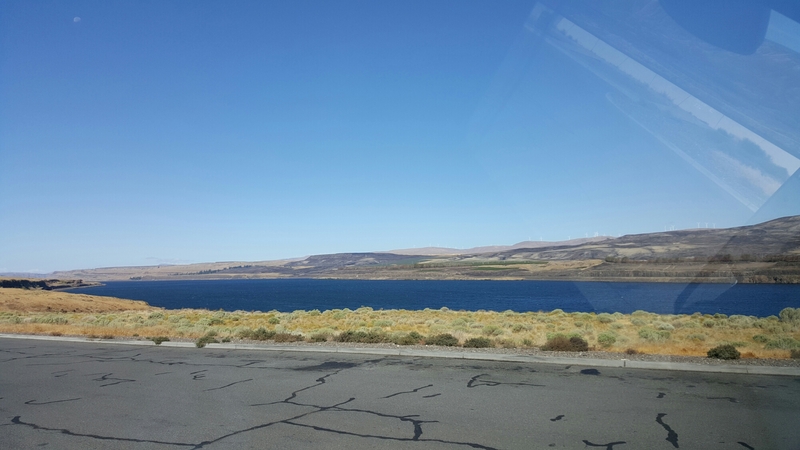 I was driving along on I-80 just west of the salt flats in Utah. it’s a pretty lonely (but pretty) stretch of highway. I noticed a couple chunks of something black in the road up ahead, and assumed they were chunks of another truck’s blown tire (also called ‘alligators,’ or ‘gators.’). You always try to avoid running these over because they usually have some pretty hefty sharp wire running through them. 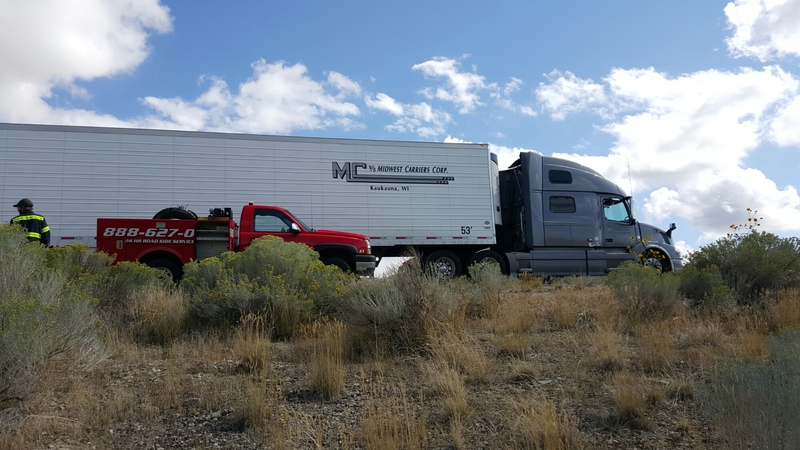 They can pop tires or fly up and cause damage to your truck or other vehicles around you. They’re dangerous. Well, these chunks were right in my way, directly in front of my right steer tire. There was a truck behind me and I believe a car passing me, so I didn’t really have the option or time to move over a lane. 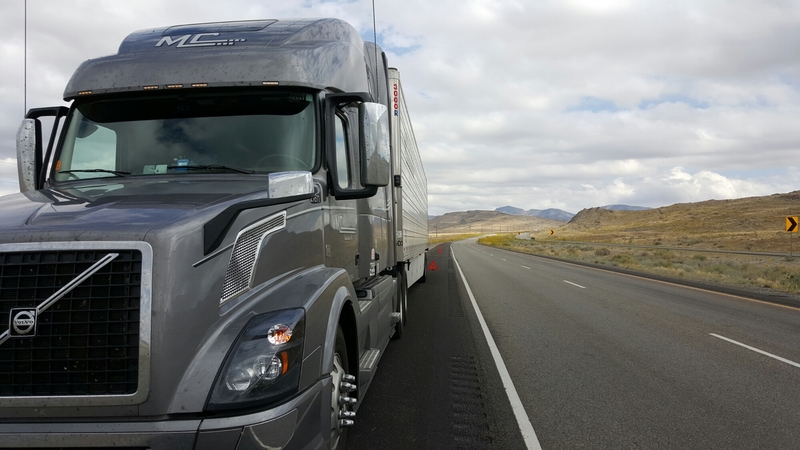 I steered toward the right, just a smidge, maybe just enough to touch the white line with my right steer tire. 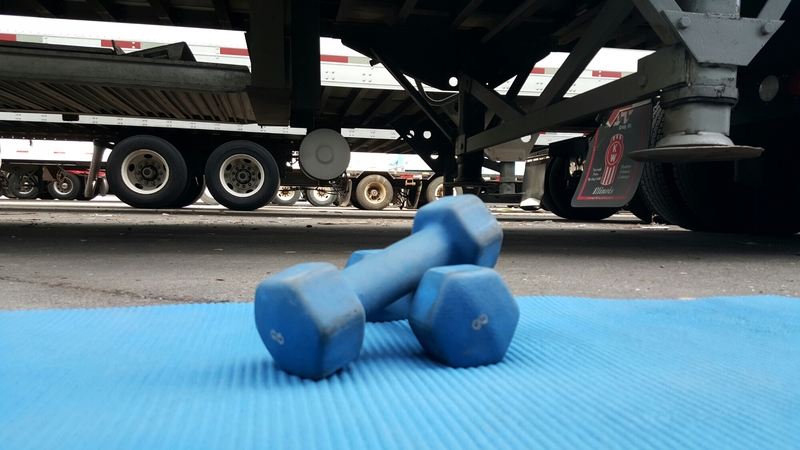 The chunks passed underneath my steers and drives, but just about the time it would’ve passed under the trailer tires I heard a “THUD!” Just the sound – I felt nothing. The first weird thing I noticed was that the truck behind me immediately moved into the left lane. Then I checked my passenger-side mirror, and was pretty certain that I saw a couple pieces of something black fly off onto the shoulder from our truck. I immediately threw on my four-ways and safely pulled to the side of the highway. Thankfully there wasn’t a ton of traffic, and this particular stretch of highway was pretty straight. Adam had woken up just a little bit before this happened, so we both jumped out and walked toward the trailer tires. Yikes. Sure enough! A giant, shredded, gaping hole in our right, front, inside trailer tire. The damage was impressive! I pulled out our emergency triangles and got them set up while Adam got going on the phone calls. We make a damn efficient team, I tell ya! Then we just had to sit for 2 – 3 hours and wait for the tire guy to arrive and fix us up. 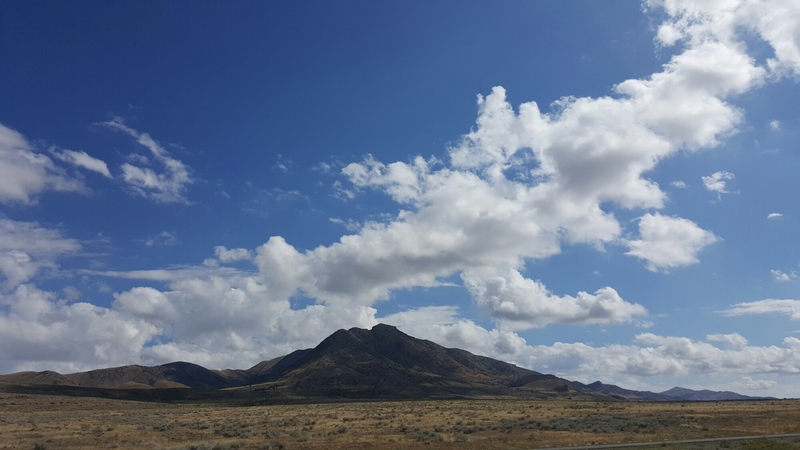 We played on our phones, I did some exercises (in the truck so as not to distract any passing drivers and risk being hit), I vacuumed the rugs and floor of the truck, made up my bed and enjoyed the surrounding scenery under a bluebird sky. It wasn’t so bad being forced to sit and soak that in! Then the tire dude showed up – super-nice guy. I talked with him a bit and when I told him I hit a gator he said, “oh, those black chunks a little ways back there? I almost hit those, too.” He said he was pretty sure they were some sort of hard plastic. He guessed another truck had a blowout and those pieces were some part of their truck. So that kind of explained the violent result to our poor tire. Although, I’m sure if you hit a gator just right it would do the same thing. 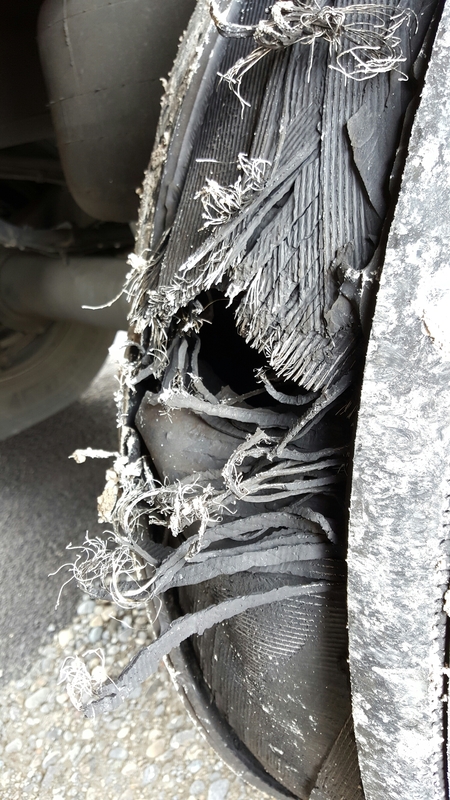 So anyway, I wasn’t happy that I ran something over in the road, but it was kind of reassuring to know the blowout wasn’t because I missed a weak spot on the tire during one of my inspections. We inspect those tires several times a day, so that would’ve bummed me out. Yay for nice tire fix-it dudes! In the end, we got a new tire and were on our way. 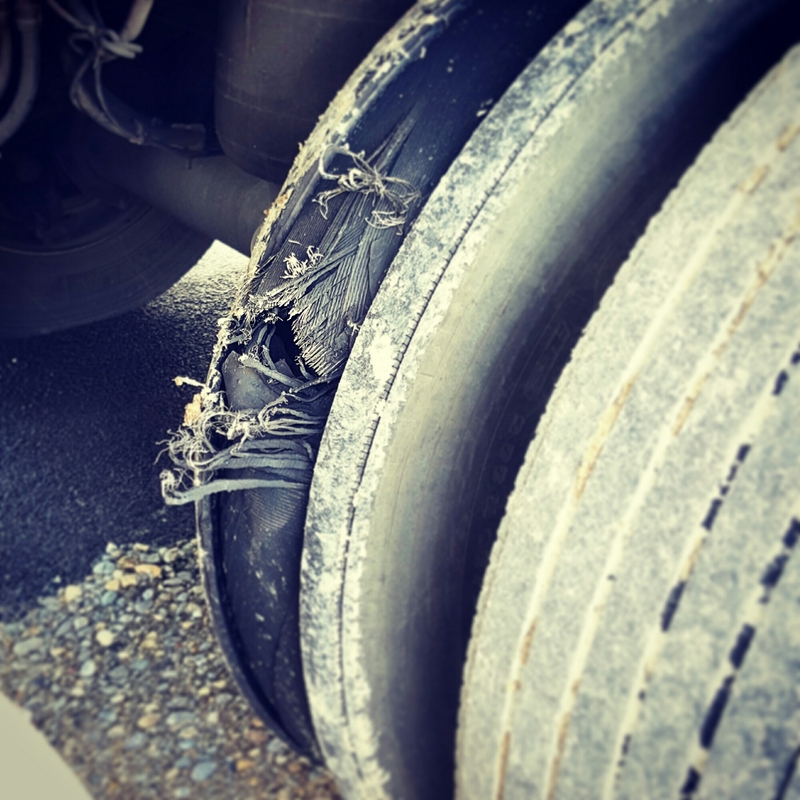 We had to skip our shower and keep moving to make our deliveries on time the next day, but all in all, not too bad of a first tire blowout experience. I was shaking, don’t get me wrong. It’s freaky. But nobody got hurt and there was no other damage done to our truck or any other vehicles. Is there a such thing as good bad luck? I dunno. That’s something to ponder. Tonight I love clear, long, lonely stretches of cruisin’ highway. Triangles! At least it was a pretty spot, right? Lots of pretty flowers... or is it a weed? I don't care. Pretty. 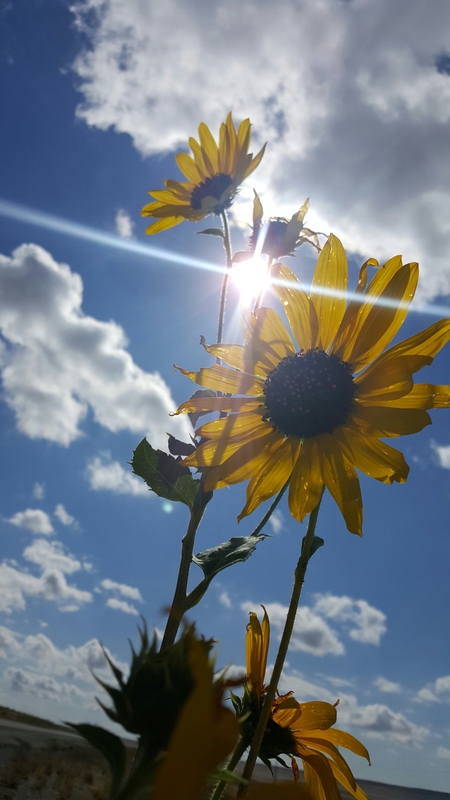 I know I haven’t written in a while, but I’ve been in a bit of a writer’s funk lately and must have needed the time off. Then today this totally random, small thing happened and I thought, “this is funny [to me] and I should blog about it!” So I guess I’m back. I hope, anyway, because blogging makes me happy. So before I build too much suspense over something kind of stupid, there’s this crank on our trailers that raise and lower the landing gear. 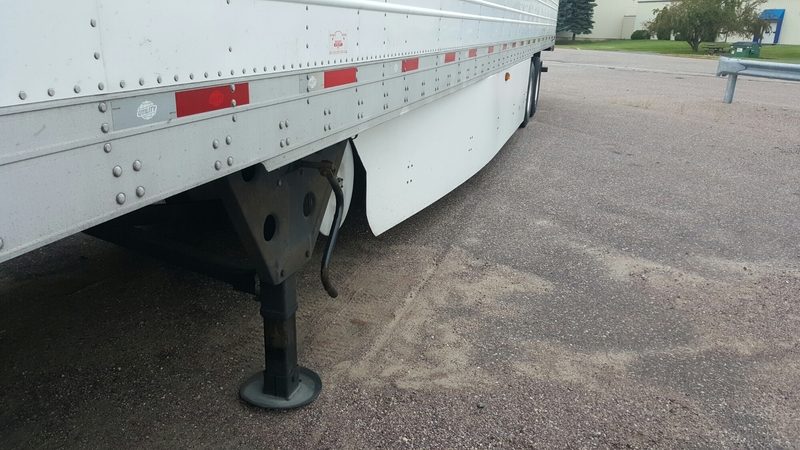 The landing gear is basically the “feet” on the trailer so when we drop it from our tractor the trailer will stay standing up and not take a nose dive. That would be bad. The handle (crank) is that crooked piece of pipe on the left-hand side of the photo and the "feet" are the thingies holding up the trailer. On our trip to the receiver in Wisconsin from Washington state, it rained. It rained a lot. And really hard, too. In the past, when I’ve gone to crank the handle to lower the landing gear, water that had build up inside the handle from rain (the handle is basically like a bent, hollow, metal pipe – see photo above) would fly out and douse me with nasty, rusty rain water. I learned – but only after getting wet shoes a couple of times. 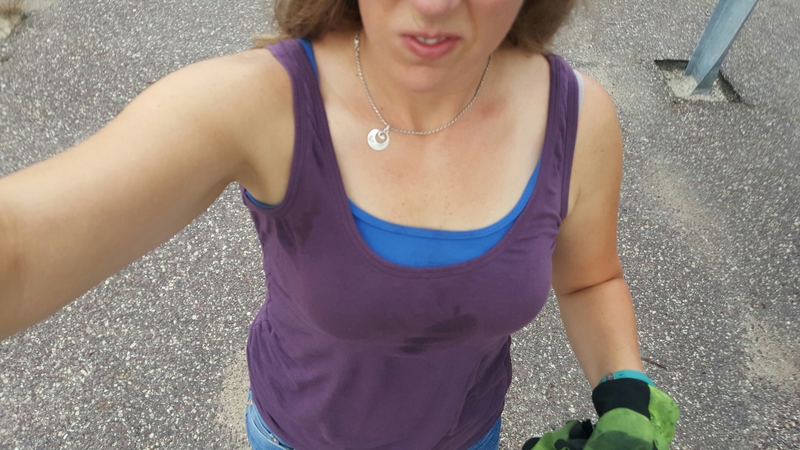 Today I pulled the handle up, stood back and a ton of water splashed out onto the ground. I did a little internal celebration, feeling proud that I remembered. Then I went in for the kill and gave that thing a good, fast turn. It suddenly spewed out a perfect line of cold, dirty, rusty, nasty water! I guess it wasn’t done with me yet. It arched just perfect as if the handle was strategically aiming for me. It started at my armpit, went straight across my chest and down the front of my tank top, soaking my chest from the inside of my shirt, and finishing by soaking the other armpit, and also somehow getting a big splash right into the inside of me left glove. I jumped back and just said, “awwww, maaaaan!” It was gross, but I still somehow found it funny. And you know what? I showered about 3 hours before this happened. Go figure! Just can’t stay clean on this job! Good thing I’m a hiker and trucker and I’m used to being dirty. Haha! Tonight I love showers. Even if I won’t be staying clean for long. Sometimes my gym is surrounded by tires, is littered with cigarette butts and smells like stale pee. But you do what'chya gotta do!